PIRACY is an illegal diffusion of video contents. PIRACY is a film program in several volumes presenting movies available online for free. PIRACY is questioning the notions of diffusion and education against transgression. The TV Commercials is a recent compilation of Burden’s four legendary television interventions, which date from 1973 to 1977. For each of these conceptual projects, Burden purchased commercial time on broadcast television and aired his own subversive « ads. » Included are TV Ad: Through the Night Softly; Poem for L.A.; Chris Burden Promo, and Full Financial Disclosure. Burden’s on-screen text adds precise details about the airing of these pieces. 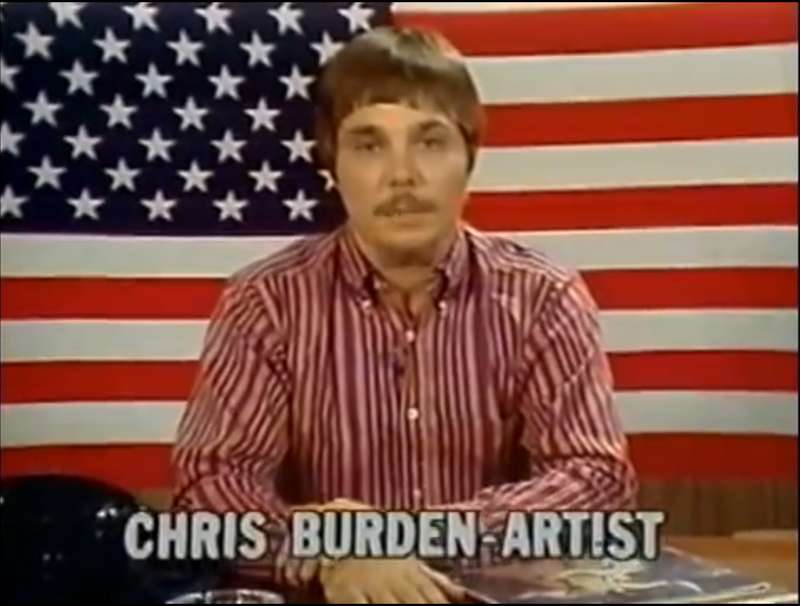 Chris Burden was born in 1946 in Boston, Massachusetts, and died in 2015 in Topanga, California. He received his B.F.A. in 1969 from Pomona College, California, and his M.F.A. in 1971 from the University of California, Irvine. Burden has been the subject of numerous solo exhibitions including “A Tale of Two Cities,” Orange County Museum of Art, California (2000); “Tower of Power,” Museum Moderner Kunst Stiftung Ludwig, Vienna (2002); The Baltic Centre for Contemporary Art, England (2002); “What My Dad Gave Me,” Rockefeller Center, New York (2008); Middelheim Museum, Belgium (2009); “Three Ghost Ships,” Portland Art Museum, Oregon (2011); “Metropolis II,” Los Angeles County Museum of Art, California (2012); “Small Skyscraper,” Armory Center for the Arts and One Colorado, California (2012); “Extreme Measures,” New Museum, New York (2013); “The Master Builder,” The Rose Art Museum, Brandeis University, Massachusetts (2014); and “Ode to Santos Dumont,” LACMA, Los Angeles (2015). His work is featured in major museum collections worldwide including LACMA, Los Angeles; Museum of Contemporary Art, Los Angeles; Whitney Museum of American Art, New York; Museum of Modern Art, New York; Museum of Contemporary Art, Chicago; Tate Gallery, London; Middelheim Museum, Antwerp; Inhotim–Centro de Arte Contemporanea, Brazil; and 21st Century Museum of Contemporary Art, Japan.